For the last two decades, REDtone International Bhd has built its business around telecommunications network infrastructure and services for private and public-sector clients. Now, with an eye on the future, the company is betting on the Internet of Things (IoT), specifically the smart city sub-segment. This may look like REDtone is moving away its core businesses, which contribute 99% to group earnings. But group CEO Lau Bik Soon insists that IoT is actually complementary because REDtone is already in most of its components, from infrastructure to cloud. “If you look at IoT architecture, the first component is infrastructure and we understand this part of the equation very well. IoT builds on that. The next thing is about putting sensors on top of it. The next layer is about making sense of the data collected by the sensors. If you cannot make sense of this data, there is no meaning. Making sense of the data involves two main things – cloud and application,” he explains. Lau is very clear about the fact that REDtone will not venture into IoT solutions for consumers but will focus on corporate clients and government agencies, as it always has. Potential IoT customers comprise mostly government agencies and local councils wanting a smarter way of providing public services. The potential application of smart city solutions, which have been rolled out the world over, includes smart traffic lights and street lamps as well as automated flood mitigation programmes. The business case for smart city solutions is that local councils or township developers can employ technology to offer more effective and cost-effective services. All of this sounds very tempting but Lau admits that REDtone has yet to sign on clients for its IoT solutions. However, it has been rolling out pilot projects, which runs for about three to six months, so potential clients could have a sense of the possibilities. Pilot projects currently in the works include a smart metering system that enables local councils to use sensors to monitor street level parking, collect payments or roll out enforcement when needed. Another example Lau cites is of safe cities where CCTV cameras are given technological boost, so that they can make sense of video data to alert authorities in case of potential security risk. This includes situations where a public area is swamped by a lot of people or if someone leaves a bag unattended. When prodded, Lau cannot say confidently if any paying clients will sign up soon. “This is actually a long-term journey,” he adds. For now, the contribution of the industry’s digital service segment to group earnings is almost negligible. REDtone’s industry digital services segment houses its telemedicine business, cloud services and IoT. The segment posted a gross loss of RM84,000 on revenue of about RM613,000 for the size months ended Oct 31, 2016. REDtone’s two core businesses of telecommunications services and managed telecommunications network services, still its largest revenue earners, contributed 57% and 42% to turnover respectively. Telecommunications services brought in revenue of RM44.37 million and gross profit of about RM19.23 million while managed telecommunications network services posted a revenue of RM32.73 million and gross loss of RM1.03 million in the six-month period. In recent quarters, REDtone’s earnings have come under pressure, given higher costs, project delay and the weak ringgit. The company suffered a net loss of RM2.63 million in 2QFY2017 ended Oct 31, compared with a small net profit of RM398,000 in the previous corresponding period. Revenue though rose from RM35.06 million a year ago to RM39.26 million, which included RM5.3 million from discounted operations in China. For the six-month period, REDtone saw a net loss of RM3.79 million on revenu of RM77.7 million. No comparisons can be made with FY2015 earnings because REDtone changed its financial year end from May 31 to April 30 following its conditional takeover by Berjaya Corp Bhd in May 2015. Berjaya Corp is the company’s largest shareholder with a 51.72% stake, followed by the Sultan of Johor, who holds 17.92%. 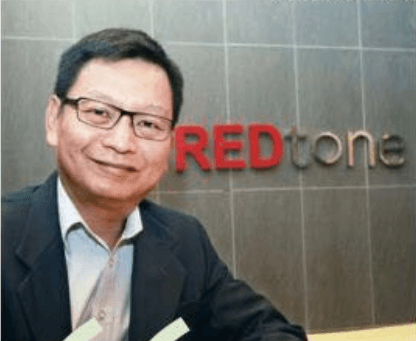 REDtone’s share price has been beaten down in the last two years, falling from a five-year high of 88 sen on March 17, 2015, to 36.5 sen last Thursday. Current prices value REDtone’s stock at about one times book value, given its annualised net asset value per share of about 36.1 sen.